The city’s “great fire” of 1889 excited its already boom town qualities with the great labor of rebuilding more than 30 city blocks from scratch and real estate loans. The technology for running electric trolleys came to Seattle only months before the fire and following the destruction, trolley systems – in addition to cable cars – began to send out their trunk lines in most directions from the city’s core. 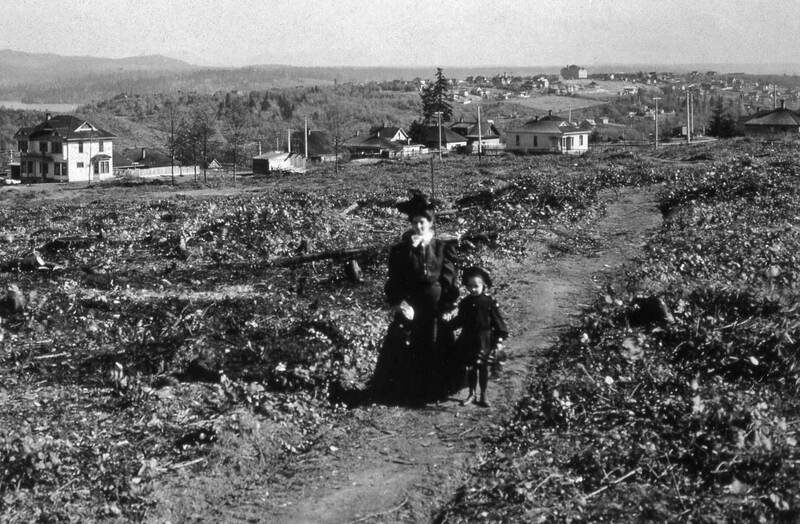 Many in the immigrant tide needed cheaper land to build their homes – sites not in old Seattle but also not far from it. The new common carriers to Ballard, the University District (still named Brooklyn then), Beacon Hill and those on the east shore of Lake Washington obliged. Three lines reached the lake – at Leschi, Madison, and Madrona. There all of them featured parks and other attractions like promenades, canoes for hire and nature trails. The line to Madrona was the last of the three and the final part of it, where the trolley cars descended to the lake, was in the embrace of a picturesque forest. On reaching the lake riders found bathhouses, a dance pavilion, and rustic benches disturbed along paths that led back into the forest. 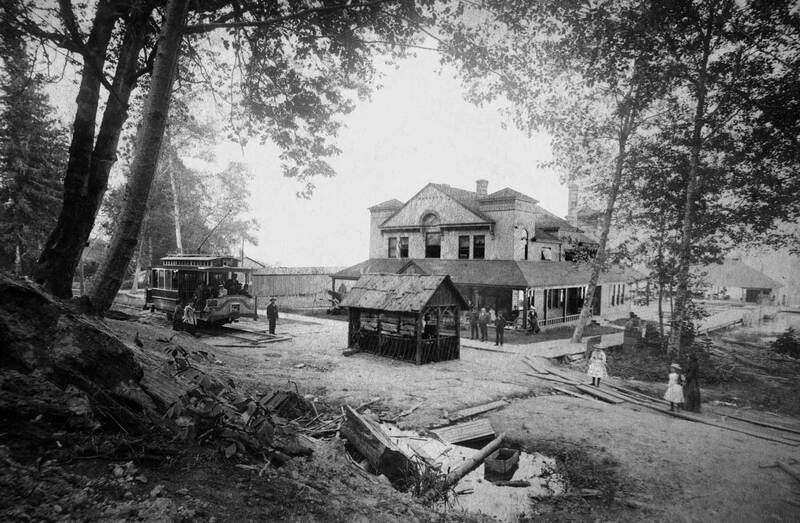 The hotel shown here greeted them at lake’s edge. The Madrona hotel was built in 1892 and that’s the date penciled on the flip side of the original photo card produced by A. J. McDonald, a photographer responsible for a few of the best suburban scenes hereabouts in the early 1890s. 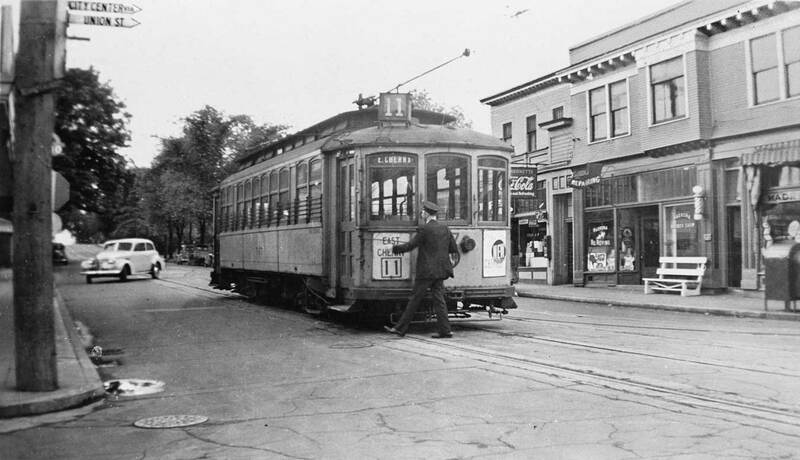 On the left a trolley car stands at the end of its line. Perhaps McDonald road that car to the park to make this impression, while the conductor waited for him to return for the ride back to Pioneer Square, with a First Hill transfer on Broadway Avenue to a James Street cable car. The fare from waterfront to waterfront – Elliott Bay to Lake Washington – was five cents. The view above is used courtesy of an old friend, John Cooper. Next, another look toward the same steps but taken further back (to the north) to show the park’s swings as well. And now the feature from 1993. 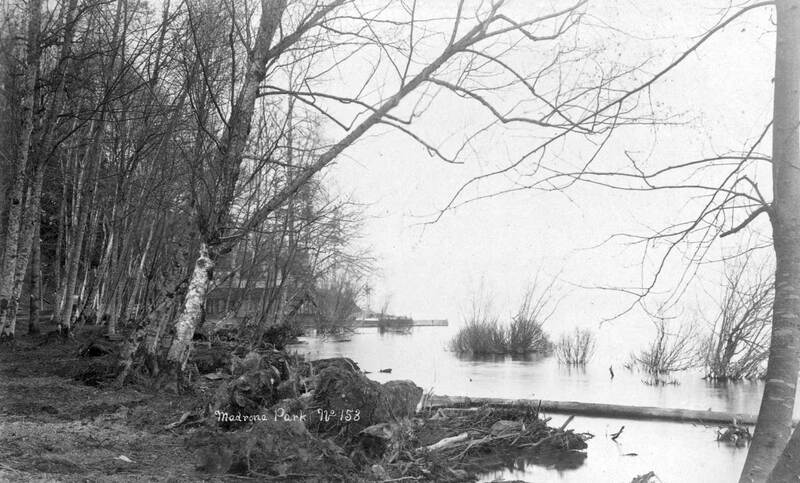 Of the string of parks along the west shore of Lake Washington, the first three – Madison, Leschi and Madrona – originated in the early 1890s as marketable retreats by street railway companies, who also owned nearby lots for sale. The trolley trip to Madrona Park might have begun on a James Street cable car at Pioneer Square (or Place). It soon transferred at Broadway to a narrow-gauge electric trolley that took off through a patchwork of cleared and wooded tracks for Lake Washington. 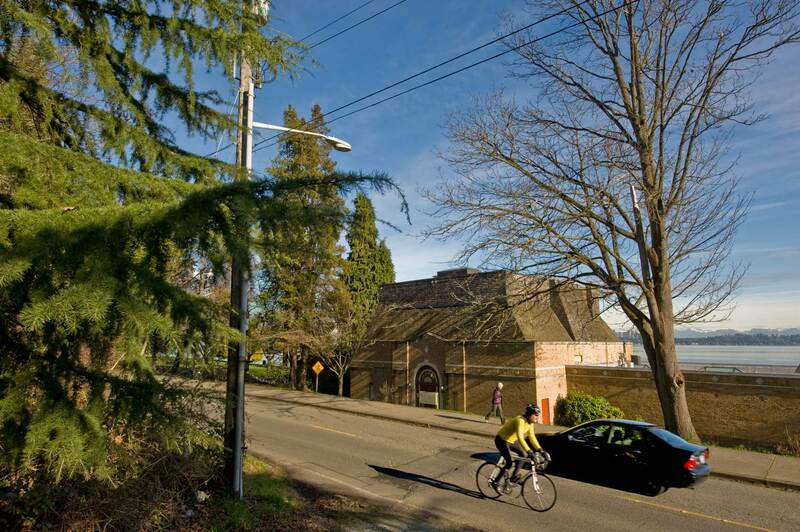 It was a route with many turns and a final loop that directed the swaying cars down a “deep wild canyon” (Madrona Drive) to the Union Trunk Line’s terminus at Madrona Park. 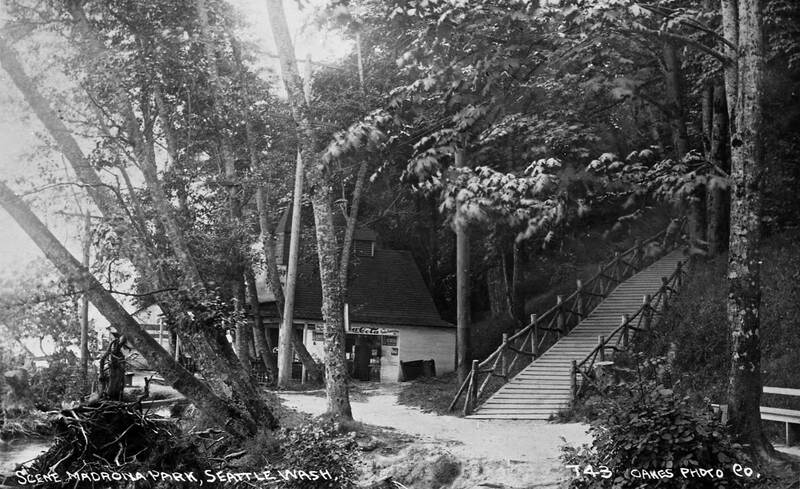 As noted above, the park’s principal attractions were a boathouse, hotel, refreshment stand and a maze of forest trails. 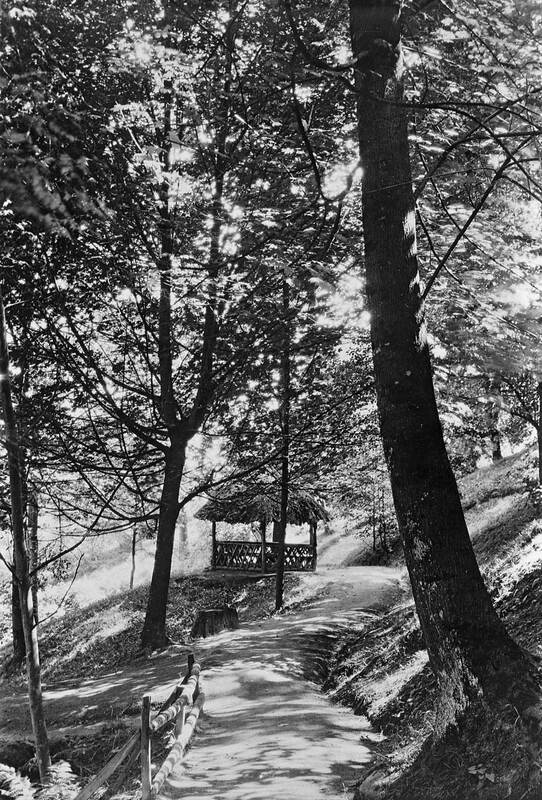 The trails were furnished with rustic benches and, near the parks summit, a gazebo, which looked down to the waterfront through a screen of firs, alders and the few madrones that gave the park its name. This record of the park's gazebo was copied from the Charles Whittelsey collection, which we have use here for other subjects. 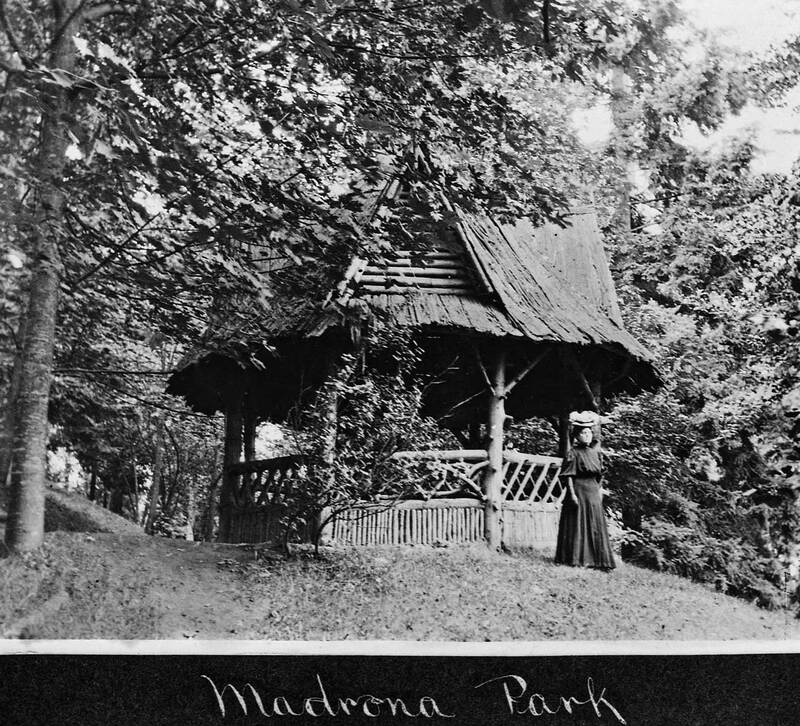 In 1908 the trolley company sold Madrona Park to the city. 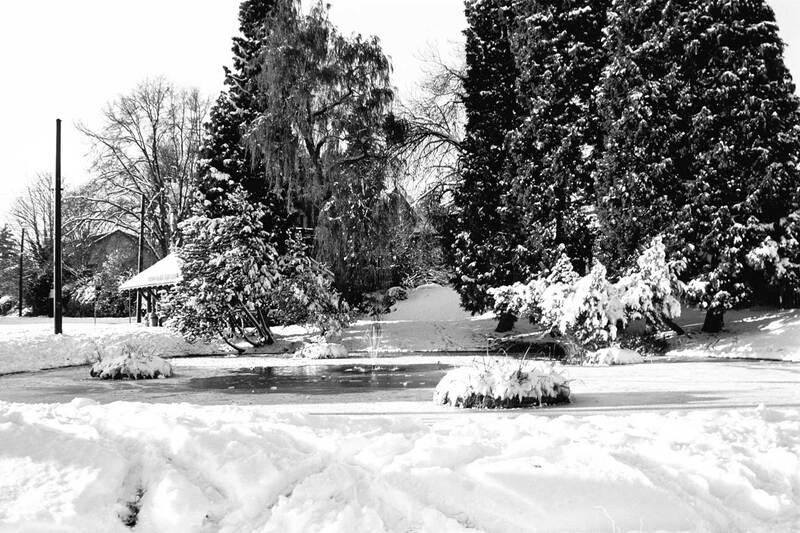 The purchase was partial fulfillment of the city’s commitment to the park plan developed for Seattle by the Olmsted Brothers, Boston’s famous landscapers. The plan’s citywide boulevard system included one beside the lake. Park of this was ready for Seattle’s Alaska Yukon and Pacific Exposition of 1909. At Madrona part of the new road was built offshore on a wooden trestle. 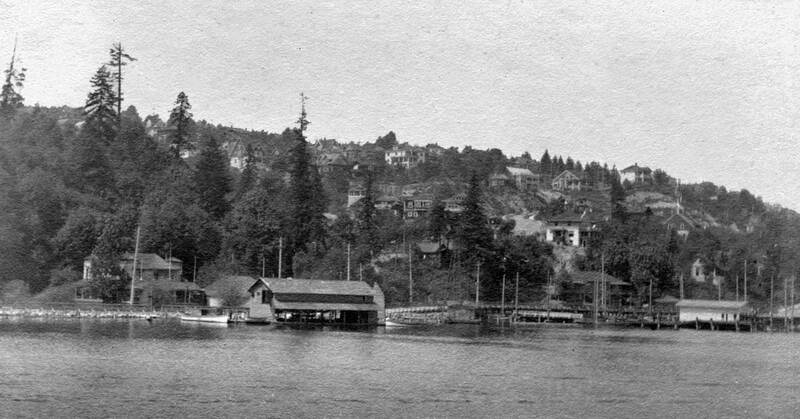 A 1912 regrade was extended with a new shoreline in 1916 when Lake Washington was dropped nine feet with the construction of the ship canal. 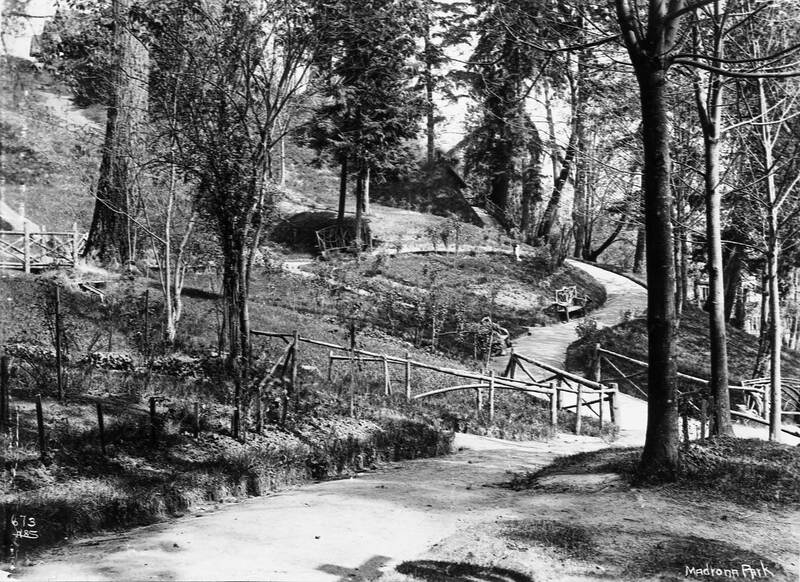 In 1925 the boulevard through the park was relocated at the base of the hill and there it has stayed. A rare look at the park from the lake, ca. 1911. 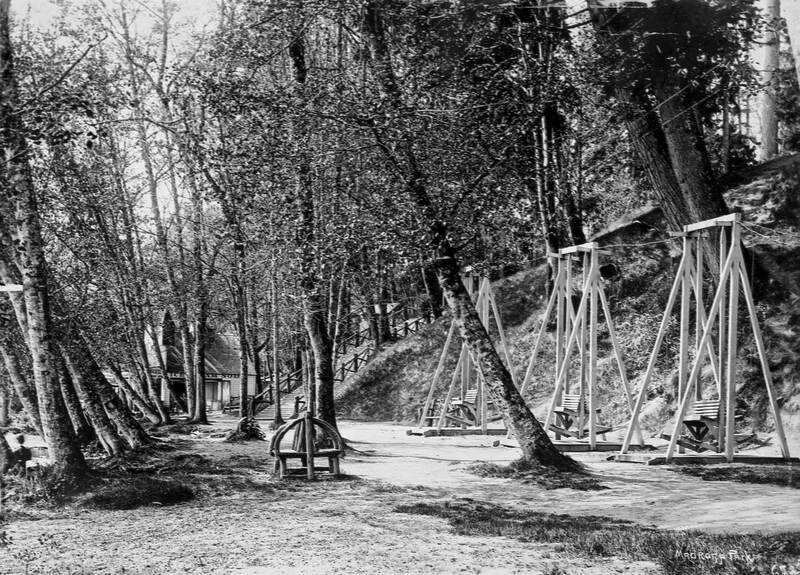 The trestle on the right may be the one in use before the lake was lowered 9 feet in 1916. A detail taken from a wide panorama that is kept in the Holy Names Academy Archive. Madrona School is evident on the horizon. The view looks southeast from near the present location of Holy Names on Aloha Street. An unidentified stereo that, if I have studied it correctly, shows the same distant Madrona on a hill. The original names were probably given by George and Emma Randell who developed this Madrona Ridge in 1890 and built their home one block west at Drexel Avenue, or 35th now – I think. 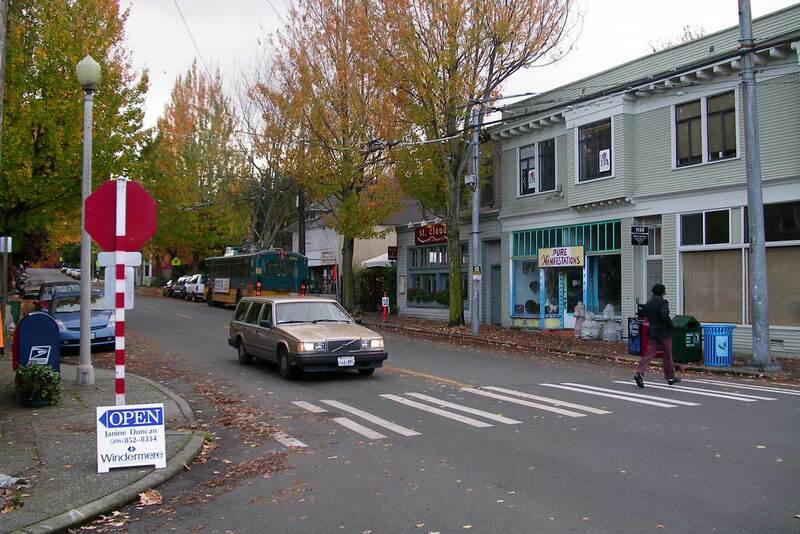 They did well, especially after the Union Trunk Line trolley to Madrona Park reached this intersection in 1892. The park first and then the neighborhood soon after got its name from the trees (arbutus) that were also residents. Thereon the Randall barn became Randall School and stayed so until 1904 when one of the typical frame box schools designed by school architect James Stephen opened at 33rd Avenue (AKA Alvan) and Union and was also named Madrona. If the tax records can be believed the frame structure that survives on the right of both views was constructed in 1907 and has fulfilled its own century. The historical photo dates from ca. 1940 when the trolleys, like this car No. 376 on the No.11 Cherry Street Line, were traded for buses and, here also, trackless trolleys. The 1938 Polk Directory (also by my desk) lists the same businesses that show in the photograph – the pharmacy on the corner, followed by a barber, a shoe renewer, a luncheonette and a fish market – all of them named Madrona, except the café. Vernon and Anna Herrett who run the luncheonette, live upstairs, and Walter Cort, the cobbler, lives behind his store on 33rd..
Perhaps some reader will write and share the Carroll or Drexel or Alvan Stories. One likely storyteller would be Junius Rochester who wrote “The Last Electric Trolley,” in part a history of Madrona. But that lucky historian is often away conducting tours on Columbia River cruise ships and may not be easily reached. The above now-then feature first appeared in Pacific late in 2006. Long before I found the THEN used above, I snapped this look at the Minerva Pond while driving to Jim and Anne Faber's Madrona home in the winter of 1985. Both had been feature writers for the local pulps. Anne was art critic for The Times for a time. 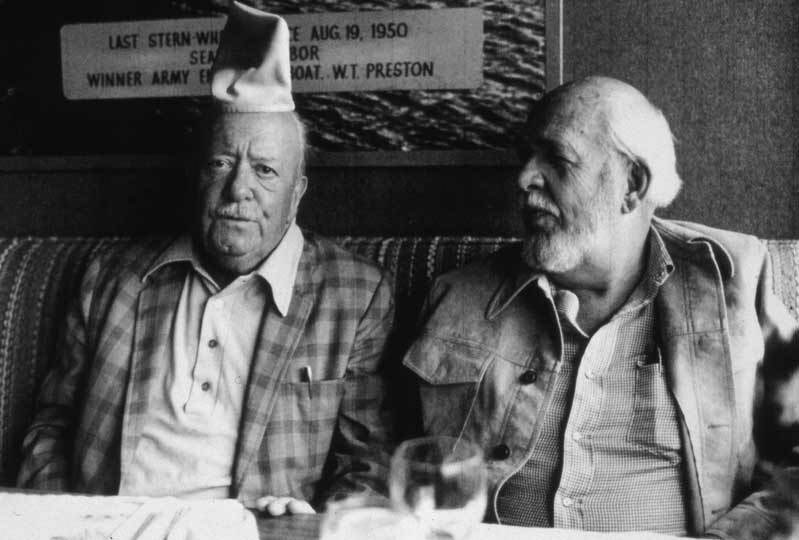 Jim was Century 21's first head of pubic relations before he was called to act as press agent for Mo Udahl in the Department of the Interior during Kennedy's presidency. Jim was the entire mensch*. He introduced me to Ivar Haglund, which has subsequently taken some of my time. Both Jim and Anne are now long gone, and I still miss them. I now remember taking a snapshot of Jim outside his home when I arrived there on this slipping trip. Perhaps I'll find it. Here's part of the pond story. The historical view looks east across a well-tracked Maiden Lane E. to a scene that bears two obvious correspondences to the contemporary view. A light dusting of snow defines the dark waters of what was somewhat ambiguously called Denny Blaine Lake Park and the enclosed shelter beyond it. Both the pond and the shelter have been altered some in the something less than a century that separates them. The name has also changed. While the contemporary scene shows more of the pond and the lawn that borders it, the panoramic sweep also reduces the size the shelter. The part that is not hidden behind a tree appears beside Denny Way E. on the left. The pond with its fountain — named Minerva for the wife of one of the park’s developers, Elbert Blaine — now has a concrete border that barely rises above the level of the water. The larger ornamental part of the fountain is gone, only a pipe now just surmounts the pond. 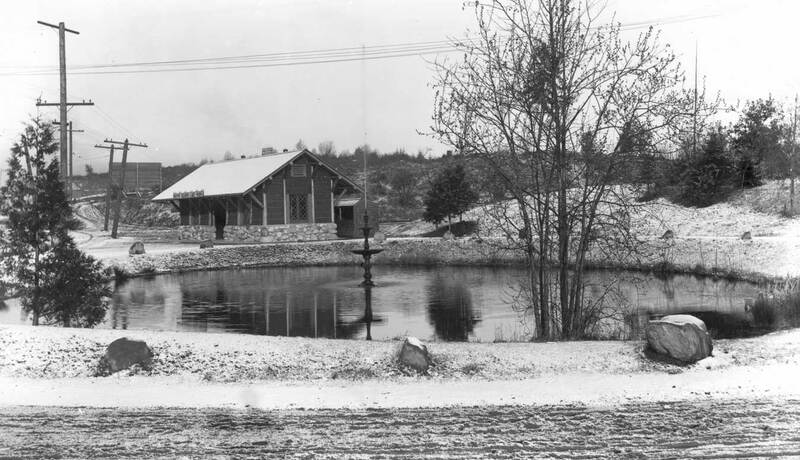 The shelter was built first as a real estate office to help Elbert Blaine and Charles Denny sell the lots in their new Denny-Blaine Lake Park Addition after it opened in 1901. After the selling was done the shelter continued to serve as a covered waiting station for the electric trolley line to Madrona Park. Problems with vandalism – broken windows and jimmied doors – were solved in 1924 when both the inner and outer walls were removed leaving the sturdy shelter as it survives. The sign on the roof with the name of the addition still faces Denny Way. A 1961 proposal to remove it – some thought the sign was confusing — was thankfully rejected by the park board. Beginning with ice-age geology Rochester continues with the most thorough telling of the stories connected with the development of the contiguous neighborhoods named in his title. Quoting the author, “along the way I introduce luminaries that lived in these neighborhoods such as Richard A. Ballinger, Henry Broderick, Betty McDonald, Theodore Roethke, James Stevens, Mary McCarthy, Kenneth Callahan, Hiram C. Gill, John H. “Doc” Hamilton, Ellsworth P. Storey, and more.” Recently published in 2002, Rochester’s book is still in print and not hard to find. 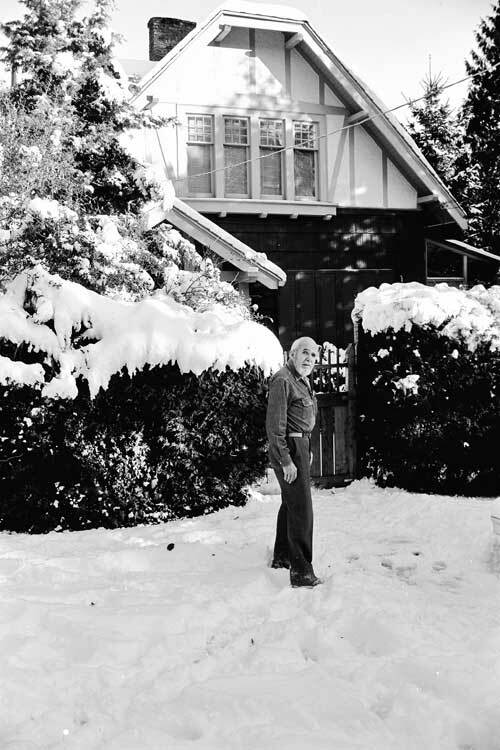 As I found Jim Faber when I pulled my Karmann Ghia into his Madrona driveway. Part of Jim Faber’s Century 21 pitch to get federal support for Seattle’s fair. The date, I think, is wrong in the caption below the press picture, which Jim probably sent out. 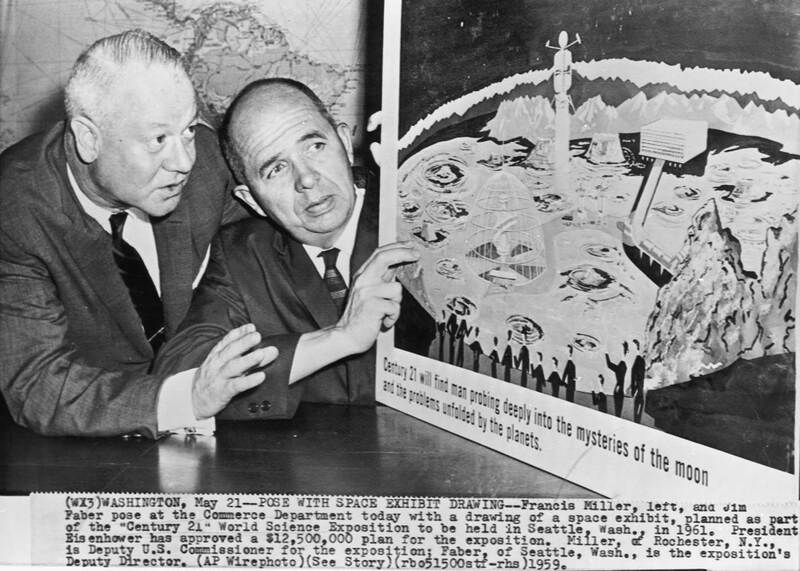 And I wonder now if it was Jim who wrote “Century 21 will find men probing deeply into the mysteries of the moon and the problems unfolded by the planets.” It did not work out that way – with the other planets and their problems. We have continued to get more on this one than we could handle and have got little relief from outer space. 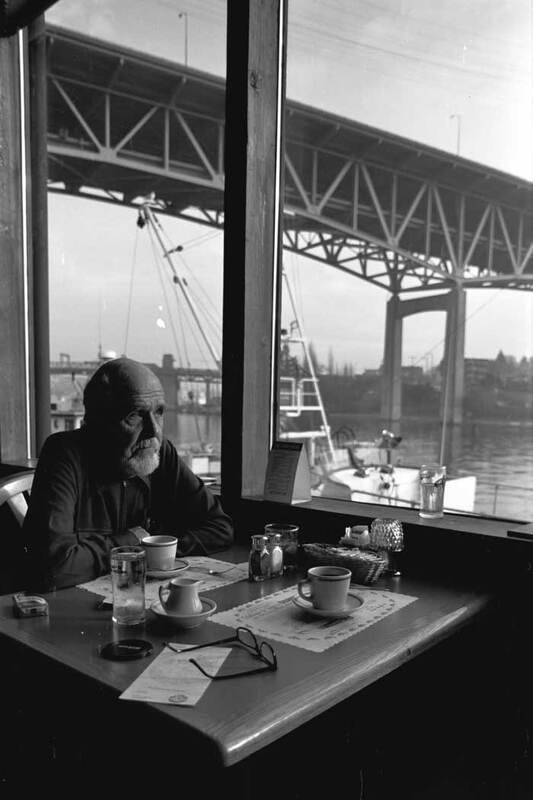 Jim Faber at the Salmon House 1987. Ivar and Jim at the Captain's Table after Jim titled him "King of the Waterfront" with an improvised crown. Now staying with the tricksters we return to the Madrona waterfront with the story of its Sea Monster. 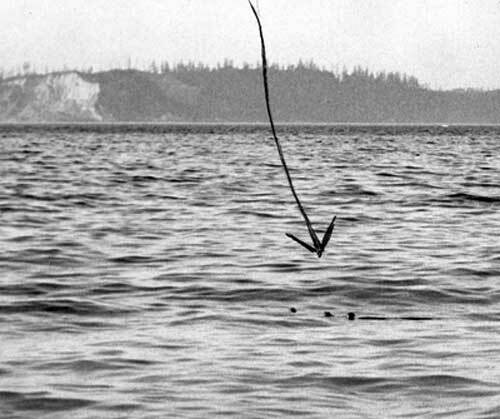 Ivar conceded that his evidence for the existence of the Madrona Sea Monster might be interpreted by some as the rumps of ducks swimming in line. Courtesy, Ivars Inc.
Other sightings soon followed including confirmation from another landmark restaurateur, Ray Lichtenberger of the namesake boathouse in Ballard. Ray claimed to have seen it “heading out to sea.” A.T. Goodman, assistant lock master, agreed that a clever monster could have made it through the Chittenden locks by hiding beneath a vessel. Another authority confirmed that “sea monsters can survive on salt water, fresh water, or bourbon and water.” Certain that they favored fresh tuna Ivar concluded “Madrona will probably be caught soon. It’s getting careless.” He was cannily confident that the monster was headed for Vancouver, where every aquarium attendant was equipped with gill-nets and sliced Tuna. Next and last (for atonement) we go to church. The city’s boom years of the early 20th century was accompanied by a proliferation of services and institutions into Seattle’s new neighborhoods. This included the churches and this example, the Episcopalians in the Denny-Blaine neighborhood. The date for this waterborne inspiration was August 1907, which makes this the Centennial year for the parish. The rustic English Gothic chapel printed here took four years more to build and another sixty-seven years to become an early pick for Seattle’s official registry of landmarks in 1978. The natural charm of this wood and brick sanctuary was created to compliment the style of the “city beautiful” Denny-Blaine Addition, which is appointed with streets that do not march through the neighborhood on a grid but rather curve through the natural topography as it descends to the shores of Lake Washington. Many of the Denny-Blaine homes are also landmarks, whether listed or not, and a few are by one of Seattle’s most cherished architects Ellsworth Story (1897-1960). Story was both a member of Epiphany Episcopal and the architect of this its first parish. 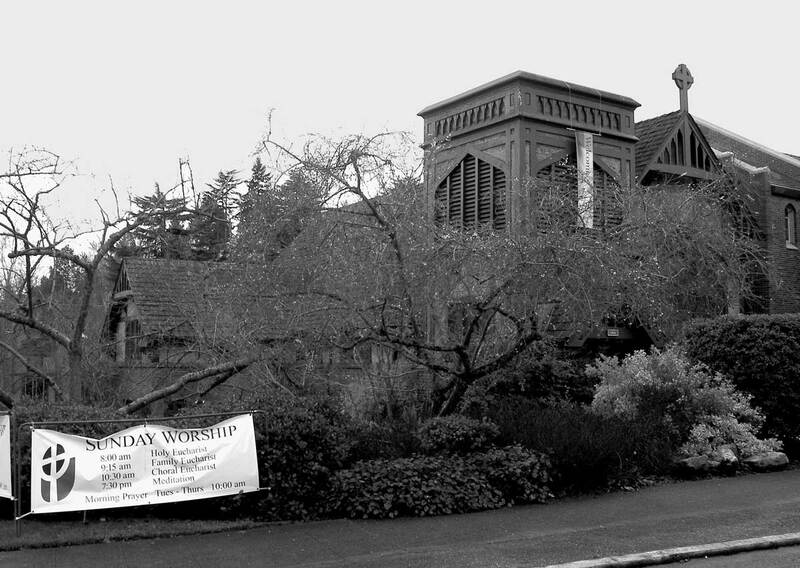 The landmark Epiphany Episcopal Church at 3719 Denny Way in the Denny-Blaine neighborhood was built in 1911 from designs by Ellsworth Story, a member of the parish. Courtesy, Episcopalian Diocese. 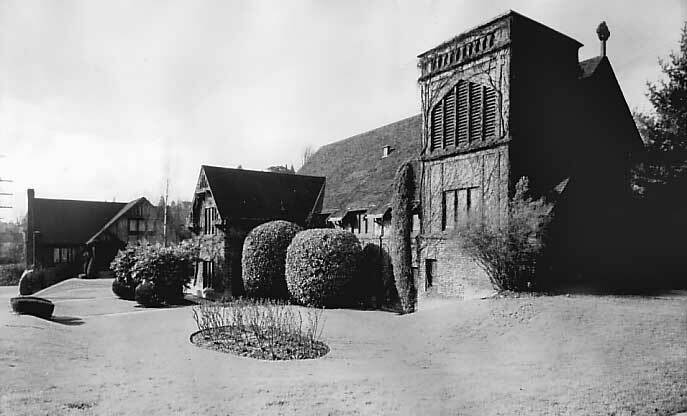 In order to see around a tree and through the parish landscaping the contemporary photo was recorded from a position somewhat closer to the sanctuary. We conclude this Madrona Park essay with an early view of it recorded by a busy pioneer photographer named LaRoche. One can compare the structures half-hiding behind the trees here with those in Rod Edge's trolley-with-hotel photograph at the top. * Mensch: A decent responsible person with admirable characteristics. This piece, Madrona Park – End of the Line is one of the finest you guys have ever done. Especially interesting because I’m studying the history of the area with Junius Rochester. Thanks, guys. Great work.